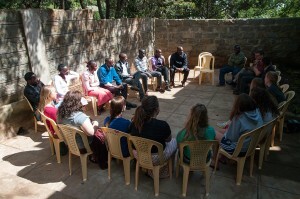 The Kenya team had another early morning today! We left for a morning safari ride at 6:15 a.m. With Benson and Wilfred at the wheel, we traveled through the game park once again. From the vans we watched the sunrise, an incredible display of God’s creativity. We were blessed to see more buffalo, impala, and zebra today! These animals were together in incredible numbers today—at one point, we counted over 25 zebra in one place! The baboons were awake and active as we traveled this morning. They were in the road, in the trees, and in the brush. 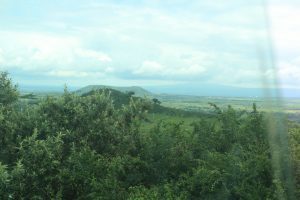 We drove to a lookout point where the baboons came a bit closer than some of us expected. After snapping a few pictures of the view, we headed back into the vans before the baboons decided to revolt. We headed back to the lodge and arrived just in time for 9 a.m. breakfast. After enjoying our morning meal, we packed our things and prepared for our journey out of the park. Although we did not get a glimpse of the “Mufasa” we all wanted to see, we were able to see some flamingos, two more hippos, as well as three rhinos! 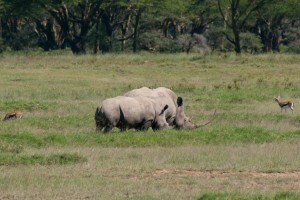 The first rhino encounter was a black rhino. The second rhino encounter was a mother white rhino with her baby. The horn on the mother was incredible! Even Dr. Dixon said he had never seen one so large. Even without a second lion sighting, it was an incredibly exciting and eventful safari! After exiting the park we began our journey back to Kijabe. 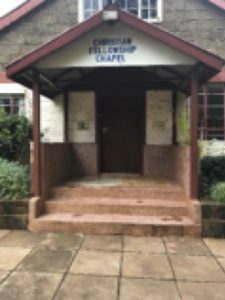 We had all enjoyed our time at the game park, but we were anxious to come back to the Daraja House, our “home” here in Kenya. Benson and Wilfred brought us safely back to the Daraja House in a few hours, and we were all thankful to relax for the afternoon. Some took the opportunity to nap, others headed to the roof to enjoy the sunshine. It was a wonderful time to reflect on the weekend and our many experiences. There has been much reflection as our time in Kenya in coming to a close. We have seen and experienced so many different people and places here, it can be difficult to make sense of it all. We have seen the poverty and struggle of Maai Mahiu as well as the wealth and comfort of the Nakuru Park Lodge. It brings about important questions. Should we feel guilty for being Americans who can afford comfort? What about our return to Ohio? What should we do then? These questions have deep and complex answers. We don’t know why we have been blessed with comfort. We do not know why we have any of the blessings we have. We are wrestling with the question of what to do with what God has given us. All of us have been given gifts. Being born in America is a gift. Going to Malone University is a gift. Eating three meals a day is a gift. A gift. We have not earned them. God is not obligated to give them to us. For some reason, he has chosen to do so. Rather than feel guilty that we have been given these gifts, we are trying to focus on living a life of gratitude for these gifts. To be thankful for each and every gift God has given and live with open hands. If we return to Ohio with an attitude of thankfulness rather than guilt, we will be better able to use the gifts God has given us. He has a reason for giving us these gifts and our prayer is that he will show us how to use them. As we continue to process what we have experienced in the coming days, weeks, and years, we pray that God will continue to challenge us to a live a life of greater thankfulness. God is taking us on a “spiritual safari” to travel even deeper in our relationship with him.